As the winter solstice approaches, we move into “winter wedding” mode. Lots of whites, creams, and ivories are accented with branches and eucalyptus; in this case, sprayed gold. Our bride carried “Patience” garden roses, “Playa Blanca” open white roses, white ranunculus, gold seeded eucy. and dusty miller. The bridesmaids, in beautiful hunter green dresses, carried smaller bouquets with the same theme and color palette. The Sheraton Pittsburgh Airport Hotel in Moon Twp., was the the scene of this elegant reception. 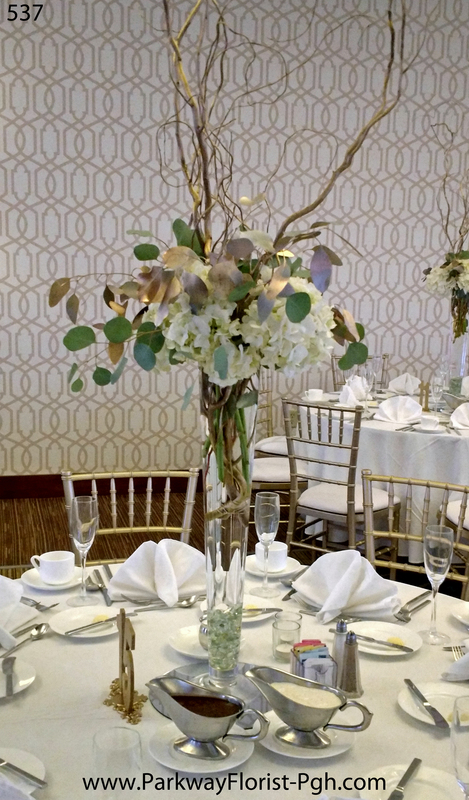 Gold branched centerpieces containing white hydrangeas and gold eucalyptus were scattered throughout the ballroom, giving visual dimension to the room. Low centerpieces graced the remaining tables. Gold chiavari chairs added to the overall classic feel of the wedding & reception. Congratulations and thanks to our wonderful bride and groom for allowing Parkway Florist to be part of your day. Best wishes and much happiness to you both……and Merry Christmas! 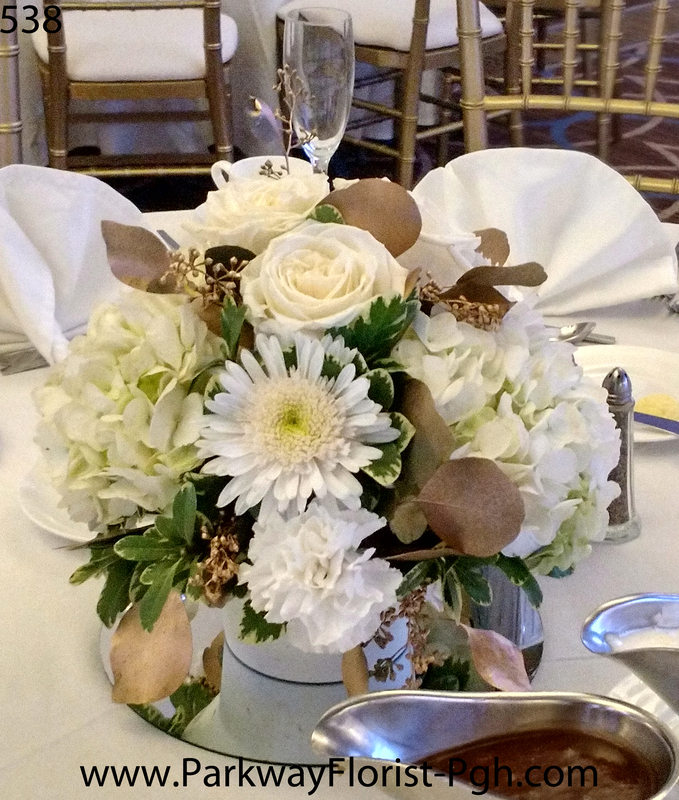 This entry was posted on December 5, 2017, in Weddings - 2017 and tagged branches wedding centerpiece, garden roses, gold and ivory wedding flowers, Gold and White Wedding, hydrangea, parkway florist pittsburgh weddings, pittsburgh wedding florist, pittsburgh wedding flowers, pittsburgh weddings, pittsburgh winter wedding, wedding flowers, white bride bouquet, white roses, white wedding flowers, Winter Wedding Flowers, winter white wedding. Bookmark the permalink.